A mill and miller were recorded in the 1086 Domesday Book entry for Tilston, but it is not known if the mill is Stretton or is another mill site in the parish. The earliest specific record of a mill at Stretton is in 1351. 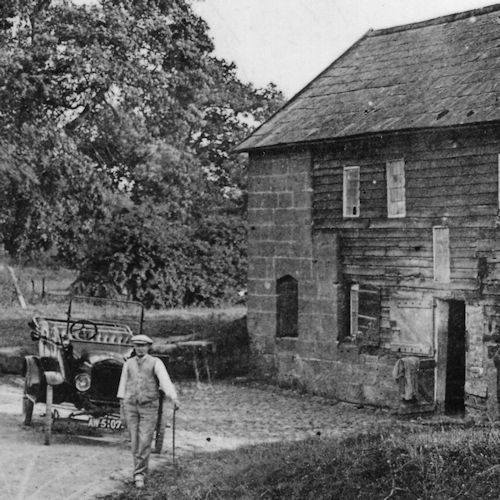 Little is known of the mill at this time except that the mill pond is the same location today as it was then. The current mill building was started in 1630 on the footings of an earlier mill building, the cobbles of which can still be seen inside the mill today. At this point, Stretton Watermill had become the estate mill for nearby Carden Hall which was owned by the Leche family. 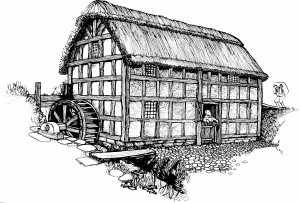 The 1630 mill was a timber box-frame construction with a thatched roof. The timber frame can still be seen inside the mill today, complete with holes for the wattle uprights, and the oak mullions of a long blocked-up window. 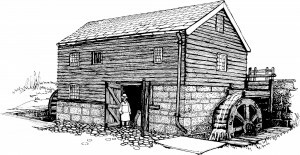 The mill at this time had a single wheel at the east end of the building, which probably supplied power to two sets of mill stones. Further work was completed in 1647, with the date carved into a beam that is visible at the west end of the building. In 1770, the roof was raised and the thatch replaced with slates. The earlier timber framing was covered by weatherboarding and the lower parts cased in sandstone from the Carden estate. More significantly, a second (overshot) waterwheel was added at the west end of the mill and another two sets of stones were installed to cope with the increased demand created by improvements in agriculture. The names of the key people responsible for these 18th Century alterations were inscribed onto a cornerstone beside the overshot wheel. There was now so much machinery in the mill that in 1819 the upper floor of the mill was extended out over the east waterwheel, enclosing it and giving more space to store grain upstairs. The east waterwheel was replaced in 1852 with a cast iron breastshot wheel manufactured at the W H Smith foundry in Whitchurch. The extended mill of 1819 is the building frontage you see today, unchanged for nearly two centuries. Stretton’s last miller Albert Gregory, who retired in 1959. By the end of the 19th century, Stretton was no longer grinding flour for human consumption but was instead producing animal feeds. During the Second World War the roller mills at ports like Liverpool were suffering from bombing and the grain supply from Canada and the United States was blockaded in the Atlantic. 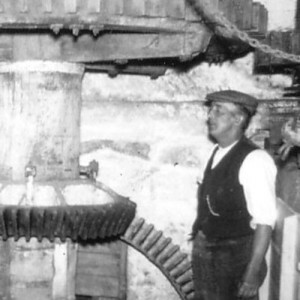 As a result hundreds of small rural mills including Stretton had to rise to the challenge of supplying the nation, working twenty four hours a day and seven days a week to meet demand. After the war, Stretton returned to producing animal feeds. In 1959, Stretton’s last miller, Albert Victor Gregory, retired. The mill lay derelict for over a decade before being bought by Cheshire County Council and restored by Cyril and John Boucher as a working museum, which opened to the public in 1977. Today, Stretton Watermill is open from Spring to Autumn each year and welcomes thousands of visitors and school pupils.